Horology is the study and science of time and time keeping, and horologists study this time keeping in clocks, watches and chronometers. Restoration, preservation, repair and the 'making of' are all skills that a talented horologist needs to learn. If you desire to become a master watchmaker or an antique clock restorer then you will need somewhere to train. 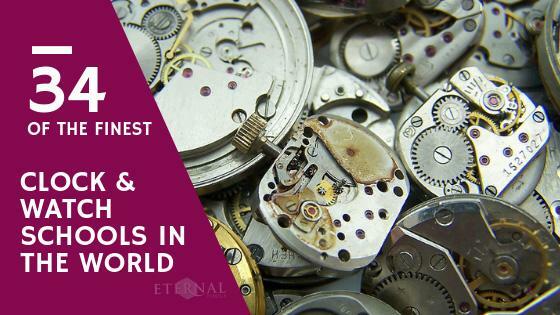 Eternal Tools has drawn up an alphabetical list of some of the finest clock and watch schools around the world to help you decide where you would like to study these wonderful skills. 1. Australian Antiquarian Horological Society Inc. Clock restoration and conservation classes plus workshops in repairs. Technicum Noord-Antwerpen features a course in Learning & Working for clock and watchmaking. Located in Quebec, Canada, the National School of watchmaking trains individuals for a duration of 1800 hours over 1 ½ years to obtain a vocational diploma. Den Danske Urmagerskole Student Service Center offers clock and watchmaking courses. This Watchmaking School is a private vocational school which has three year degree programs for watchmakers using modern technology. The Flüthe school offers two day practical and theory seminars in watchmaking for those requiring some initial insight. 8. Glashütte original watchmaker school "Alfred Helwig"
One of the finest horology schools in Germany, Hessische Uhrmacherschule offers a wide range of workshops and programs. Mecanicus offers a special watch workshop for mechanical watches and especially for old or antique clocks plus seminars for collectors and enthusiasts. Offering two year courses covering watch movement, theory, metalwork, quartz watch and antique watch repair. Following this is a three year course studying the skills for chronograph watches to become a master Watchmaker. The Vakschool, Schoonhoven offers a wide range of vocational courses in horology. The only official public school in Spain in which you can study for 2 years clockwork mechanics. Assembly, disassembly and manufacture of parts for wristwatches and large clocks. IHU Urmakarskolan is one of 13 schools in the world that has a partnership with the Swiss watch industry through the organization WOSTEP. The Technical School of the Vallee de Joux is a school known for its competence in the field of microtechnology watchmaking, jewellery and micromechanics. Financed by it's members of leading Swiss watch brands, WOSTEP is an independent institution offering many courses in watchmaking, chronographs and chronometry. 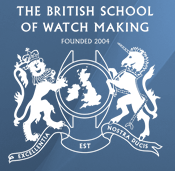 The Diploma in the Servicing and Repair of Clocks/Watches – Level 4, Diploma in the Repair, Restoration and Conservation of Clocks/Watches are courses given by the British Horological Institute with the prime purpose to provide a national qualification, with accredited national standards. These are one of a kind programs in the UK which prepares students to all levels of employments in the aspect of clock and watch servicing. A renowned school for antique clock conservation and restoration, West Dean College gives students the chance to work in workshops at dedicated workbenches. West Dean's Clocks programmes will prepare the student for exciting opportunities in a variety of prestigious national and international institutes including museums, Royal Collections and/or private client work. Degree course designed to educate students in horology. Week long courses for beginners or experienced clock makers held in a stately home. 10 students per class limit with approximately 4 courses per year. The WOSTEP programme. Students will master Swiss mechanical and electronic watches. Epping Forest Horology Centre runs evening classes in clock and watch restoration and development. The NAWCC offers a variety of educational workshops for anyone from the curious beginner to the advanced horologist. As part of AWCI’s continuing education program various Bench Courses can be scheduled in your local area. Some courses which could be offered include:Balance Staff & Timing, Timing & Adjustments, Quality Control, Quartz Watch Repair & Diagnostics, Mechanical Chronographs, Modern Wristwatch Oiling Procedures and Servicing ETA Quartz Chronographs. Gem City College School of Horology offers a wide range of course from their school of horology. with the latest diagnostic applications utilising state of the art electronic equipment. MATC offers clock education courses teaching the skills and understanding in disassembling, assembling, and repairing pendulum clocks. It also offers an advanced watch repair course which focuses on disassembling, assembling, repairing, cleaning, and oiling of watches. A school teaching both watch and clock repair for students at all levels. Norwest School of Horology is the only independent school for the study of watch and clock repair in Seattle. They offer a range of courses in watch repair, clock repair and micro-machining. Courses are open to anyone with an interest in learning! Since 1946, some of the best luxury watchmakers in the world have received their education through OSU Institute of Technology's School of Watchmaking. York Time Institutes offers a 54 week Diploma Program in Horological Conservation, Restoration and Repair, as well as customised weekend and evening courses for horological professionals, collectors and hobbyists. NAIOSW, along with schools in Hong Kong and Shanghai are WOSTEP partnership schools. They offer a 6-1 teacher, student ratio. In partnership with SAWTA (Swiss American Watchmakers Training Alliance) and supported by Rolex learn the art and science of watchmaking in an intensive 2 year course. The Veterans Watchmaker Initiative is a full time watchmaking school for disabled American veterans to be retrained in the art of horology. They are currently expanding to a new facility that will house 54 students full time. They are a certified nonprofit company. We would like to thank the institutes and course teachers for allowing us to showcase their clock and watch education programs. The list is still expanding so if you know of any courses or educational institutes that you think should be listed here, we'd love to hear from you, please get in touch.